Above fees do not include the USAT One-Day License Fee (if applicable). The Donner Lake Triathlon is a USA Triathlon sanctioned event. A one-day license is $15.00. Annual license is $50. Athletes under the age of 18 do not purchase a one-day license. Instead they must purchase a one-day youth membership, which is $10.00 or an annual youth membership at a cost of $15. Annual USA Triathlon members need not purchase one-day licenses. Refunds are not available for this event for ANY reason. We also strictly do not allow athlete-to-athlete transfers, for any reason. This is a USA Triathlon policy which we cannot circumvent. If the event is NOT sold out, a discount code for 70% of your race registration fee will be offered until 7 days prior to the race date. No discounts codes will be given within 7 days before the event, if the event is not sold out. If the event IS sold out, a discount code for 100% of your race registration fee will be offered until 21 days days prior to the race date. No discounts codes will be given within 21 days days before the event, if the event is sold out. Participants can make changes to their registration details up to 7 days prior to the event. Such as announcer information, T-shirt size, categories, etc. We allow you to make changes to your class up until 7 days prior to the event. For example moving from Sprint to Olympic. Participants will be charged an additional $10.00 to change the class starting 14 days prior to the event. This is in addition to the difference in class prices. Paricipants can change class 14 or more days prior to the event date for no additional fee beyond the regular price difference. Above fees do not include the USAT One-Day License Fee (if applicable). 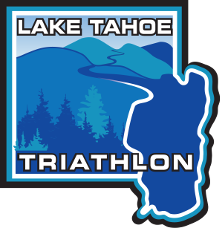 The Lake Tahoe Triathlon is a USA Triathlon sanctioned event. A one-day license is $15.00. An annual license is $15. You can purchase a license during registration if needed. Athletes under the age of 18 do not purchase a one-day license. Instead they must purchase a one-day youth membership, which is $10.00 or an annual youth membership at a cost of $15. Annual USA Triathlon members need not purchase one-day licenses.